This president has delivered more sweeping, progressive change in 20 months than the previous two Democratic administrations did in 12 years. "When you look at what will last in history," historian Doris Kearns Goodwin tells Rolling Stone, "Obama has more notches on the presidential belt." In fact, when the history of this administration is written, Obama's opening act is likely to be judged as more impressive than any president's — Democrat or Republican — since the mid-1960s. "If you're looking at the first-two-year legislative record," says [Norman Ornstein, a scholar at the conservative American Enterprise Institute], "you really don't have any rivals since Lyndon Johnson — and that includes Ronald Reagan." Along the way, Obama delivered record tax cuts to the middle class and slashed nearly $200 billion in corporate welfare — reinvesting that money to make college more accessible and Medicare more solvent. He single-handedly prevented the collapse of the Big Three automakers — saving more than 1 million jobs — and brought Big Tobacco, at last, under the yoke of federal regulation. Even in the face of congressional intransigence on climate change, he has fought to constrain carbon pollution by executive fiat and to invest $200 billion in clean energy — an initiative bigger than John F. Kennedy's moonshot and one that's on track to double America's capacity to generate renewable energy by the end of Obama's first term. On the social front, he has improved pay parity for women and hate-crime protections for gays and lesbians. He has brought a measure of sanity to the drug war, reducing the sentencing disparity for crack cocaine while granting states wide latitude to experiment with marijuana laws. And he has installed two young, female justices on the Supreme Court, creating what Brinkley calls "an Obama imprint on the court for generations." Obama has succeeded in forging a progressive legacy that, anchored by health care reform, puts him "into the same conversation with FDR and LBJ," says [liberal presidential historian Douglas] Brinkley. Readers might find it surprising there was no number 9, "Walking on Water," or number 10, "Parting the Dead Sea." On the other hand, since this was the second sycophantic piece Rolling Stone has published in as many weeks - recall co-founder Jann Wenner's syrupy interview with Obama in the October 14 issue - maybe that will be the premise of the next one to be released just before Election Day. 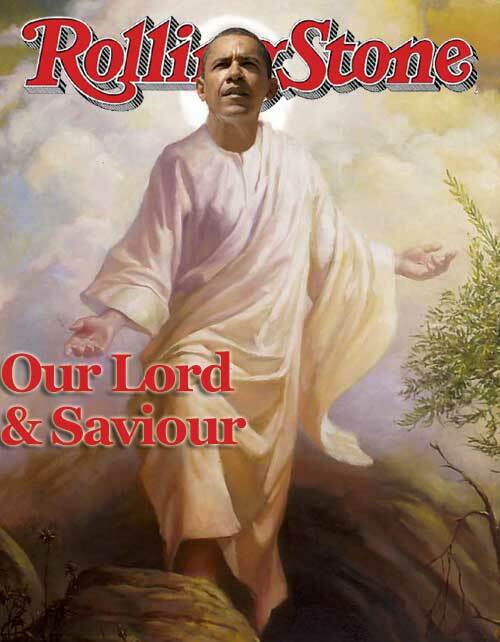 This way, the good folks at the Stone can "progress" from "Obama in Command" to "The Case for Obama" concluding with "Obama IS God!"